Residential and commercial garbage is collected at the curb throughout Oldham County. The majority of households and commercial establishments are provided service through franchise agreements with Republic Services. Check with your city government or home owners association for details on collection in your neighborhood. Oldham County and LaGrange franchise customers may set out one large household item, (which is defined as any item from your home that you would put in a moving van if you were relocating) or up to 15 bags or bundles of yard waste per week. Please contact Republic Services either online or at 502-638-9000 to start trash collection and to schedule bulk pick-ups. Curbside single-stream recycling is offered to most Oldham County residents by Republic Services. For more information or to sign up, call 638-9000. Click here for helpful information about curbside recycling. 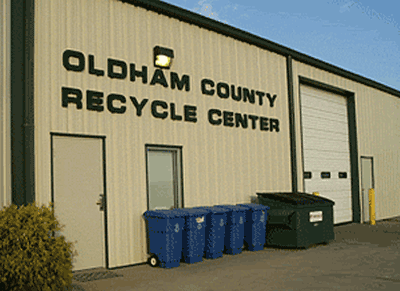 The Oldham County Recycling Center at 3943 Jones Drive accepts cardboard, paper, metals, aluminum, rigid plastics, batteries, and many electronics. This is a self-serve facility accepting dropped off recyclables from dawn to dusk, seven days per week. The Center is manned Monday through Friday from 9:00 a.m. to 3:00 p.m. Document shredding service is available on a limited basis. Items are processed and marketed to businesses that use recycled materials to produce new products. For a list of the items we accept at the Center, click on the Recycling Guide button. Oldham County receives a State grant for litter abatement for our highways and byways. Non-profit, tax-exempt groups participate and raise funds for their organization by picking up litter along our roadsides. Eligible groups include various school and independent sports teams; youth groups; and any other charitable, tax-exempt organization. We supply safety vests, gloves and trash bags in addition to paying by the mile, so get involved! Links to the program application and agreement are located on the left side of this page. A Shredding Event is held each year on the third Saturday in September so residents can properly dispose of confidential and sensitive materials safely. Shredding is done on site at the Oldham County Fairgrounds. Household Hazardous Waste collection is provided contingent on availability of state funding. The event is held on the third Saturday in October at the Oldham County Fairgrounds. Information about accepted materials is provided on this site. Private waste haulers doing business in Oldham County must be permitted each year. Should you choose to rent a dumpster service, please check with the Solid Waste Coordinator, 502-565-1007, to see if the company is properly permitted. We are governed by Oldham County Solid Waste Ordinances KOC-04-830-181, KOC-99-830-199, KOC-97-830-53 and KOC-94-800-846 and enforce the provisions contained therein.